Members of the Bike Advisory Committee, the VACC and interested citizens met Tuesday night to begin the process of updating the Municipal Bike Map. With the direction of Russ Carmichael from the District of Maple Ridge about 15 people from Maple Ridge and Pitt Meadows attended a meeting to clarify the strategy for rating existing municipal roads and pathways from the perspective of cyclists. Also, part of the exercise will be to try to identify other possible route additions and suggest improvements. A list of rating criteria had been borrowed from neighbouring municipalities and the object is to have our routes rated on broadly accepted scale. Part of the instruction to the riders was to view themselves as an "average" cyclist when assessing the routes. It has long been thought that the existing cycling map of Maple Ridge and Pitt Meadows was out of date and even erroneous in its designation of many routes. What might have been a quiet country road, suitable for a Sunday family cycle 20 years ago is now a major commuter route, busy at all times of the day with vehicle traffic. This is the reality of 132nd Avenue and 232nd St north of Fern Crescent for instance, given the patterns of suburban sprawl in these areas. 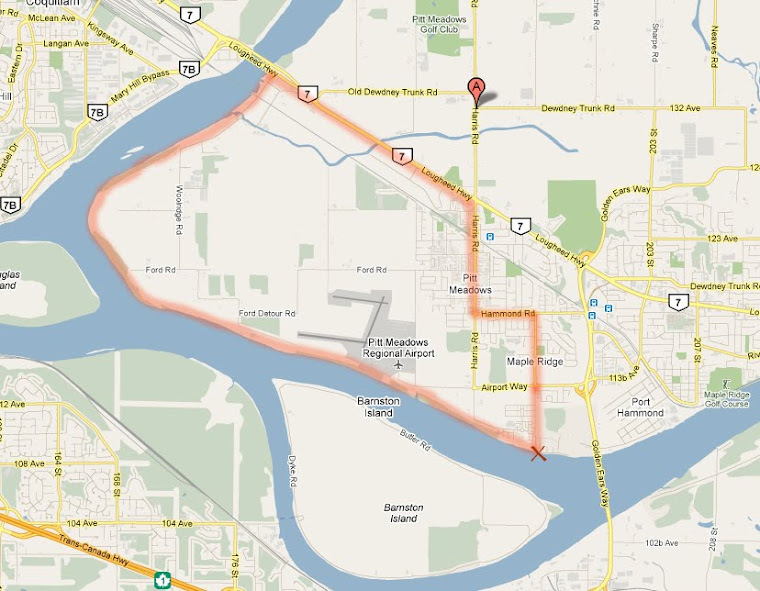 An example of "error" in the previous map was its designation of Dewdney Trunk Rd. as an "acceptable" bike route - NOT! For the next month or so people will be riding the streets of MR and PM taking careful notes and with the information gathered create a true picture of the current state of cycling infrastructure in our towns. It is also hoped that from this, specific priorities will be determined and a concrete to-do list created. Anyone interested in assisting with the assessments can still participate by contacting Russ Carmichael at the city of MR at rcarmichael@mapleridge.ca. This is great news! I refer to this site for ideas for rides as I know your data is "current", but it will also be nice to have an updated map with input from the viewpoint of an average cyclist too.